Alpha-Lipoic Acid is a powerful fat and water-soluble antioxidant. It directly recycles vitamin C and indirectly recycles vitamin E, providing additional antioxidant protection. It is also an important component in the energy production process in the cells. In recent research, 600 mg of alpha-lipoic acid daily was found to decrease plasma LDL oxidation. 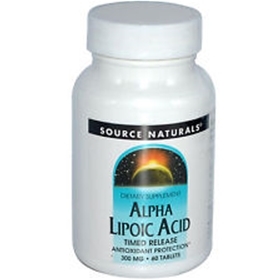 Source Naturals ALPHA-LIPOIC ACID TIMED RELEASE is designed to be released gradually throughout the day. Warning: Note: Those with diabetes should monitor blood glucose levels to avoid possible hypoglycemia. If you are pregnant, may become pregnant, or breastfeeding, consult your health care professional before using this product. Suggested Use: 2 tablets daily at mealtime. For maximum results include vitamin B complex, magnesium and coenzyme Q10 with alpha-lipoic acid in your nutrition program.